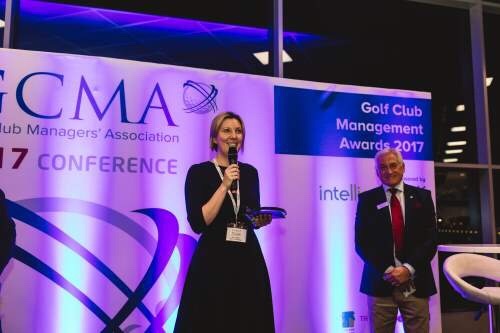 The most prestigious awards in golf club management took place at the GCMA 2017 Conference at Mercedes-Benz World in Surrey on Monday night and Director of Golf, Spa and Leisure at Fairmont St Andrews, Amy Yeates, was named the GCMA Manager of the Year. Amy Yeates, described by her nominee as being at the forefront of the evolution of golf in Scotland, received her award from Jamie Abbott – MD of intelligentgolf, and her prize includes a trip to Thailand in association with Coco Golf and Thai Airways. The judging panel was particularly impressed with the way Amy helped to drive through a new flexible membership scheme at Fairmont St Andrews, while providing inspirational leadership for her team. Amy’s inclusive style helped her build and motivate her team through trust and empowerment, which has resulted in steadily increasing revenues and green fee yields – all the more impressive considering the highly competitive area the club operates in.